Travelling between Singapore and the islands in Indonesia? No problem. Batam Fast Ferry is here to make your travelling plans smoother. Since it was established in 1985, the operator has been serving countless trips to passengers who wishes to get from Singapore to Batam Island and vice versa. When the company started, they only have two ferries in operation and now, Batam Fast Ferry is known as one of the leading ferry operators with several sales and operational offices in both Singapore and Indonesia. As convenient as the services they provide to travelers, Easybook shares the same mission to ease your travel plans. All you need to do is visit our website to book your next ferry ticket with Batam Fast Ferry without any fuss and it will only require a few minutes of your time. This operator started with 2 ferries named Bintan 2 and Bintan 3 that fits 60 and 70 passengers when they started in 1985. Fast forward to today, they have a total of 15 ferries under their belt to provide their patrons with the best services whether they are on a family vacation or business trip. Batam Fast Ferry makes sure you are in the company of great comfort and be stress-free before arriving at your destination. The ferries provided by Batam Fast Ferry are certified for ISM Code in 1998, which stands for International Safety Management directed by the International Maritime Organisation (IMO). The luxurious sea travel with Batam Fast Ferry can fit up from 140 to 338 passengers whether you are heading to Batam Centre Ferry Terminal in Indonesia or back to Tanah Merah Ferry Terminal in Singapore. With the latest navigational control on board, the ferries are also equipped with air-conditioning system, VIP room, in-house video system and a bar counter for to ensure you have a stress-free journey as soon as you board with Batam Fast Ferry. 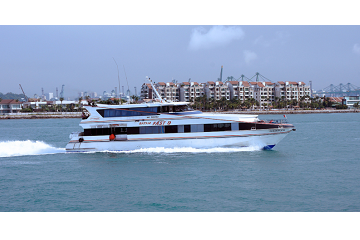 Batam Fast Ferry offers 35 departures with the 15 ferries from 6 ferry terminals to get around Batam and Singapore with ease and to provide you with great comfort no matter your destination. You are able to book daily trips from HarbourFront Centre Regional Ferry Terminal and Tanah Merah Ferry Terminal in Singapore to and fro Batam Centre Ferry Terminal, HarbourBay Ferry Terminal, Sekupang Ferry Terminal and NongsaPura Ferry Terminal in Pulau Batam, Indonesia with Batam Fast Ferry via Easybook. The travel time between the terminals are approximated at one hour or less, but do note on the one hour time difference between Singapore and Indonesia. It is important to take the weather and sea condition into consideration as well when it comes to sea transportation, which is why the travel time will be different from each other. Also, make sure to check the schedule for your trips on Easybook as well which are based on local time of the city. Below is the estimated travel time between the routes that are provided by Batam Fast Ferry. Please make sure you choose the ferry terminals that are situated near to your hotel so you don’t have to spend too much time travelling to your accommodation upon arrival. Contact your hotels to check if they provide pick-up services from the nearby terminals too. There are usually plenty of things to do when you arrive at the terminals whether you are in Singapore or Indonesia. It is very easy to reach HarbourFront Centre Regional Ferry Terminal as there is a MRT service located nearby. The Sentosa Water Sports Centre and Singapore Cable Car can be found here, as well as many food and beverage from fast food joints to food court to fill your tummy. You can also head over to VivoCity next door to grab a meal before jumping on board your next ferry or simply to pick up a few new clothes to create new memories. Over at Tanah Merah Ferry Terminal which is near to Changi, there is a money exchanger in case you haven’t had the time to do so. There is a convenient store in case you are feeling peckish to grab a snack to eat. Otherwise you can always visit the restaurants and cafes in the terminal itself. If you really didn’t have the time to exchange money in Singapore, don’t worry. You can still do it over at Indonesia’s Batam Centre Ferry Terminal. Have a break while you have a cup of coffee at the terminal before embarking on a new adventure. Mega Mall Batam Centre is situated just opposite Batam Centre for all your shopping needs. On the other side of HarbourBay Ferry Terminal, you will find various seafood restaurants to dine at upon arrival, or while waiting for the arrival of your next ferry. Don’t worry about food, because there’s plenty here. The Batam Duty Free Shop can be found at the Sekupang Ferry Terminal, as well as various spots for you to freshen up as you sip on a drink and relax. You will be able to find many eateries around the area as well. Same as NongsaPura Ferry Terminal, you will also find money exchange, ATMs, convenient stores, cafes and other facilities for your convenience. It is important for Batam Fast Ferry to provide a great service to allow everyone to travel between Singapore and Batam Island safely, fast, comfortable and enjoyable. The ferry tickets for these trips are reasonably-priced so it is best to book them online via Easybook in advance to avoid disappointment. Follow these simple steps we have prepared to purchase your ferry ticket with us. You are also able to download our mobile app to your devices in order to have it at the palm of your hand.